Mark's Tickets is the best place to find tickets for Denver Broncos fans. Just check this page for any new events or schedule updates throughout the year. We sell tickets to every Denver Broncos game around the world. We know how passionate Denver Broncos fans can be about football, so we make sure to have hundreds of tickets for every game available right up until it starts. For those looking for cheap Denver Broncos tickets, we offer tickets starting at very low prices (many times below face value). 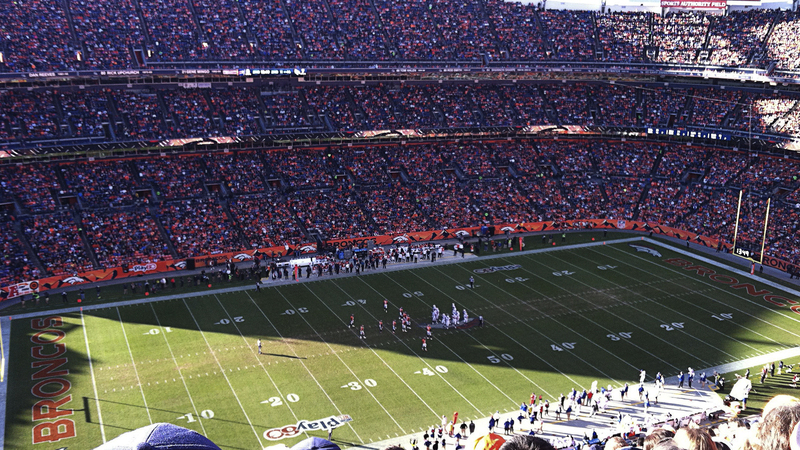 We offer tickets in most sections of every venue that you can see Denver Broncos. Simply choose the city or venue that you are interested in below, and you will be able to see all of the available seats. Do not forget that Marks Tickets also specializes in sold out Denver Broncos tickets. No longer will sold out shows prevent you from seeing Denver Broncos. The Denver Broncos are a professional football team that plays in the NFL. The Broncos play their home games at Sports Authority Field at Mile High in Denver, Colorado. With 16 games per year, and 8 being home games, The Denver Broncos are a professional American football team based in Denver, Colorado. They are members of the West Division of the American Football Conference in the National Football League. The Broncos began play in 1960 as a charter member of the American Football League and joined the NFL as part of the AFL–NFL merger of 1970. The Broncos were barely competitive during their 10-year run in the AFL and their first seven years in the NFL, never making the playoffs. They didn't have a winning season until 1973. However, four years later, they made the playoffs for the first time and advanced all the way to the Super Bowl. The Broncos have been one of the most successful teams in the NFL since then, having suffered only six losing seasons in the last 35 years. They have won an additional five AFC Championships and won two Super Bowls. They play at Sports Authority Field at Mile High, and have four players in the Pro Football Hall of Fame: John Elway, Floyd Little, Gary Zimmerman, and Shannon Sharpe.